To determine the amount of aspirin in the whole of the given solution. Charles Frederic Gerhardt, a French chemist was the first to prepare aspirin in 1853. Aspirin is also known as acetylsalicylic acid. It is the acetyl derivative of salicylic acid and is an example of a salicylate drug. Aspirin is commercially synthesized using a two-step process known as the Kolbe-Schmitt reaction. Phenol is treated with sodium hydroxide generating sodium phenoxide, which is then reacted with carbon dioxide under high temperature and pressure to yield sodium salicylate, which is acidifed, yielding salicylic acid. Salicylic acid is then acetylated using acetic anhydride, yielding aspirin and acetic acid as a byproduct. The yield of this reaction is very low due to the relative difficulty of its extraction from an aqueous state. For bulk production the salicylcate is acidified with phosphoric acid under reflux for 1 hour 40 minutes. 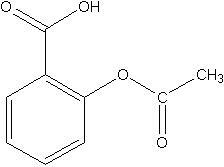 Acetylsalicylic acid is used as analgesic, antipyretic, anticoagulant and anti-rheumatic. It is also used as an additive in food, animal feed, drug and cosmetic. Low doses of aspirin may be given immediately after a heart attack to reduce the risk of another heart attack or death of cardiac tissue. It has been used for the treatment of rheumatoid arthritis, rheumatic fever, and mild infection. Large doses of aspirin cause acid-base imbalance and respiratory disturbances and can be fatal, especially in children. Gastrointestinal ulcers, stomach bleeding, and tinnitus are the main undesirable side effects of aspirin. The amount of aspirin can be determined by brominating using KBrO3-KBr mixture. A definite amount of aspirin is refluxed with NaOH. Then salicylic acid is formed. The excess brominating mixture formed is titrated with standard thio. Preparation of KBr-KBrO3 solution:- Dissolve 75 g KBr & 5.36 g of KBrO3 in H2O and make upto 1litre. 0.5 g K2Cr2O7 is weighed accurately and made upto 100 mL. 20 mL is pipetted out into a conical flask. Then add 3 mL con.HCl followed by 5mL 10% KI and titrated against Na2S2O3 using starch as indicator. 1.5g aspirin is weighed out into an R.B flask. Then 40 mL 10% NaOH is added and refluxed for 15 min. Transfer the solution quantitatively into a 250 mL standard flask, made upto the mark. From that 20 mL is pipette, acidified with 2 mL con. HCl. Then add 50 mL of brominating mixture, shake well for 15min. Then 10 mL 10% KI is added & diluted with H2O and titrated against standard Na2S2O3 using starch as indicator.